The table settings for business dinners can range from a basic table setting to a complex formal-dining table setting. To get your business-dinner table manners up to par, you need to know what table-setting items appear where and for what you’re supposed to use them. Forks are to the left of the plate, and knives and spoons go to the right. If your setting has more than one of each kind of utensil, start by using the utensils placed farthest from the plate and work inward with each course. At least one glass: Glasses are placed to the right of your plate. A bread-and-butter plate: To the left of the main plate and above the forks. A salad fork: In the United States, this is normally the farthest fork to the left because the salad course comes first, but not all cultures start with the salad. A salad plate: If salad is served first, this will probably be on top of the main dinner plate, or place plate. 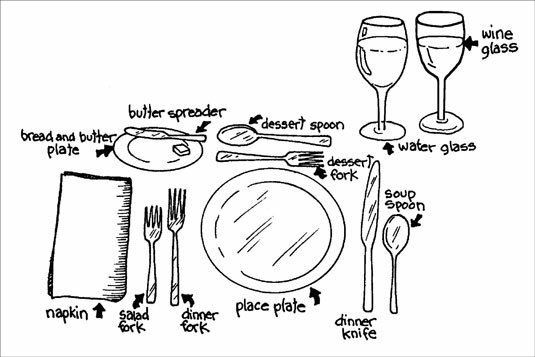 This figure shows an illustration of a basic table setting. 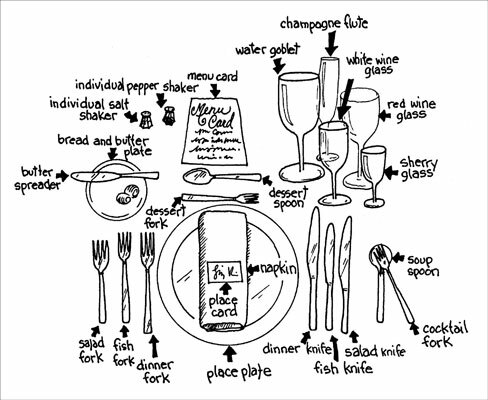 The basic setting is an abbreviated version of a full or formal place setting (like the one in the following figure), which can have any number of other utensils, plates, and glasses. If you’re unsure which utensil to use or do not know how to eat a certain food, it is best to delay by having a sip of your beverage and watching what the others are doing.